Citizens in the central Vietnamese province of Quang Nam cast their vote on May 22, 2016. Vietnam’s national election day has concluded with over 98 percent of electors casting their vote for members of the country’s lawmaking National Assembly and local-level People’s Councils. Nguyen Hanh Phuc, chief of the National Election Council Office, confirmed at 10:00 pm on Sunday that about 98.7 percent of citizens 18 years old and above had finished voting, ending a successful electoral process. “Generally speaking, the people have shown a high level of civic responsibility,” Phuc assessed. 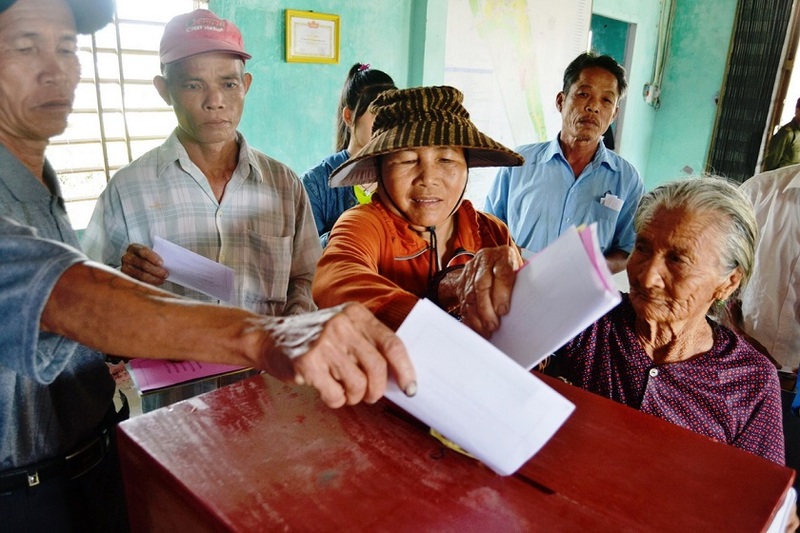 Thua Thien-Hue Province in the central region and Yen Bai Province in the north topped the percentage of voters with 99.99 percent, followed by the central province of Quang Nam and the southern province of Ben Tre with 99.98 percent, the official elaborated. A high ratio of constituents was also recorded in remote and mountainous areas, showing that local authorities had done a great job in informing and encouraging citizens to fulfill their civic rights, Phuc continued. “Party Committees, authorities, and voting committees at local level have all shown a high commitment to achieve such a number,” he added. According to the official, social security, order, and safety during the election day was ensured with no serious incidents occurring. Some small issues did arise at several voting locations, Phuc said, before adding that they were promptly dealt with by authorities. Replying to Tuoi Tre (Youth) newspaper’s question about when results would be revealed, the office chief stated that the outcome was expected to be announced within 20 days, in accordance with the law. “However, thanks to the positive progress on Sunday, the official results could be publicized sooner than scheduled,” Phuc said. During a brief interview after casting his vote in Hanoi on Sunday morning, General Secretary of the Communist Party of Vietnam Nguyen Phu Trong extended his appreciation toward all electors for casting their votes. “In my opinion, this is the largest-scale election ever held in the country’s history with over 69 million voters. I hope that all Vietnamese citizens have fulfilled their civic rights by selecting worthy people for the positions," Trong said. Ballots were cast at 184 electoral units across the country to determine members of the 14th National Assembly and People’s Council at three local levels, province/city, district and commune/ward. Voters selected 500 deputies from the 870 final candidates for seats in the country’s legislative body. The newly elected lawmakers will serve from 2016 to 2021. Sunday’s elections were organized and supervised by the National Election Council, chaired by Nguyen Thi Kim Ngan, chairwoman for the 13th tenure of the National Assembly. The process was officially scheduled to run from 7:00 am to 7:00 pm. The schedule could be changed in some cases, but was not permitted to begin earlier than 5:00 am or end later than 9:00 pm.